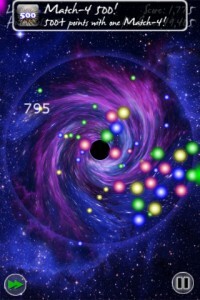 The Blackhole iPhone Game Review. Remember what I’ve been telling you about innovating age-old concepts? Well, I’m going to say it again. There’s no value in a game that doesn’t innovate, that doesn’t, in a way, create emotion. I don’t know about you, but for me emotion stems from innovation. I always like to see and play a game on my iPhone that brings something new to the table. The bigger the table, the higher the motivation for developers to innovate and stand out. And guess what, the App Store table is pretty darn big. Few developers seem to make it, but the ones that do are truly noteworthy. Today I’m going to honor such a developer with a truly creative game. 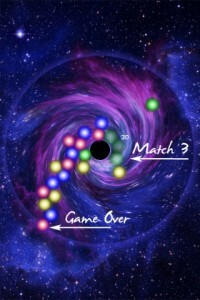 So without further a due, please take a bow to The Blackhole - a connect-three type of game that changed my perspective on connect-three games. 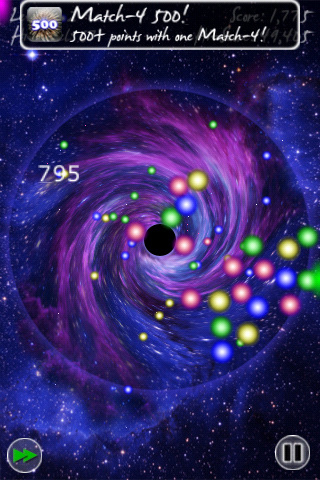 Yes, at its core, The Blackhole is just a connect-three type of game, but with a twist. The classic connect-three is balls falling from the sky, or you shooting balls at a moving spiral. With these games, you’re always in control of the ball. What if you didn’t have control over the ball but rather direct the stack of already existing balls so that the next balls lands where you want it to? That’s a rather crude description of the concept behind The Blackhole. But imagine that the balls are stars of different colors flying towards a black hole that captures every star in its range and stacks them in a circle around it. Now imagine that you can rotate the black hole so that the next star will stick to where you want it, with high precision. Now wouldn’t that be something you wanted to see? The stars will hit you from all directions. Most of the times you’ll see them coming in the form of a colored glow to the side of the screen and have enough time to prepare. Other times, they’re too fast and you need to act fast. Spin, rotate, catch the ones you need and land them where you need them. The game takes a lot of dexterity and awesome hand-eye co-ordination in order to align each star with the exact spot you want them to land. 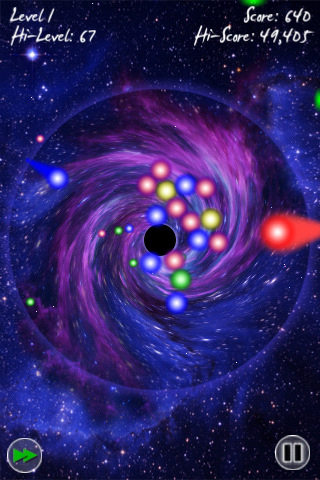 End game happens when the black hole reaches critical mass and goes (big) bang. Visually, you’ll see the black hole as a tiny black circle in the middle of the screen and a wider circle will limit how far it can expand before it reaches critical mass. Basically, if you stack too many stars and they reach the limit, it’s game over. Inevitably, you’ll realize that connecting just three stars is not enough, so you’ll want to strategize a bit and connect four or five stars of the same color at the same time. This creates a chain reaction or supernovas that will destroy all the stars in its path. After playing the game for a few hours (yes, I got into it from the first run), I can give you a few pointers, aside from the obvious think fast, act faster. 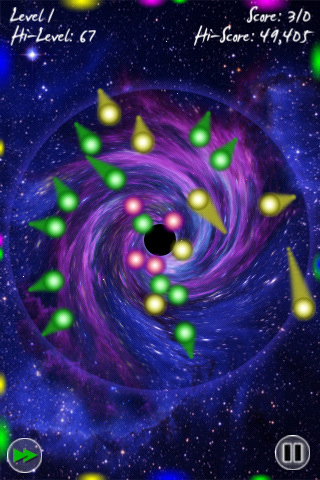 - Play the game in portrait mode as it seems to be easier to spot incoming stars. - Don’t rotate the black hole from its center, but rather use your finger to rotate from the extremities. This way you’ll see more of the exact layout of the stars around the hole in the center. - Always try to go for connecting five, plan and strategize, with the risk of stacking stars where they don’t make sense. When the supernova comes, it’ll be worth it. - Don’t try to catch all stars. If you can dodge the ones you don’t need, do it. Just rotate your stack so that the star won’t land anywhere, and watch it cross the screen. From the get-go, you’ll be impressed with the high-level of detail in the graphics. The background itself is beautiful. The Zen-like sounds add another layer of awesomeness to the game. What I really like about The Blackhole is that you can flip your iPhone and play in landscape mode. It was a nice addition, which I bet will be appreciated by the players. It’s the little things that make it that much greater. The Blackhole certainly raised the bar for developers and created some big shoes for others to fill. The true value however is in the hands of the users, and I don’t know about you, but I’m heading over to play it with the risk of it backfiring on me and hatching up an ever-increasing list of things I should really be doing instead of playing. The Blackhole is also available for the iPad. What do you think of The Blackhole ? Scroll down for our comment section and let us know! How Fast Can You Shoot Using Only Ten Fingers?